Three years after the release of the hit game “Undertale,” game developer Toby Fox has revealed something new: “Deltarune.” Free on PC and Mac, “Deltarune” features a totally new story while expanding on the style that made “Undertale” famous. Before “Deltarune”, “Undertale” sent shockwaves throughout the video game community as an unique RPG, given you could beat the game without killing a single enemy. The success was unprecedented – over three and a half million have purchased the game from someone who had to create a Kickstarter to get it off the ground. Since then, Fox had made little indication that he was working on anything else – that is, until 24 hours before the game dropped. So what is “Deltarune?” It’s not Undertale, that’s for sure. 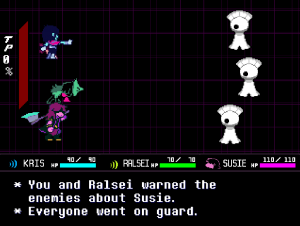 While it features cameos from most of the main cast of the previous game, “Deltarune” follows a new story. It’s unclear if it’s a prequel, a sequel, or a different universe altogether. “Deltarune” departs from the cheesy wholesomeness of Undertale and instead pictures a world more cold. “Undertale’s” prestige came primarily from the importance placed on what choices the player made. In “Deltarune,” , your choices don’t matter at all. Beyond the story, Fox’s iconic bullet-hell style of fighting has evolved, no longer encased solely inside a white box. Combat instead has new mechanics against a more visually experimental background (not to mention the players have allies that fight with them, two other characters that are already well loved by fans). Fox has developed from the artist he was in 2015, but it’s still his game regardless. But the game isn’t finished yet. Fox has indicated that player feedback from this first taste will be used to complete the rest of the game. The story is written, but “zero percent” of the actual game has been done. So for the meantime, fans can enjoy this unexpected piece of work and look forward to more.